During renovations to a cottage in Huggins Lane, Welham Green, in April 2000, a local builder came across a time capsule of historical treasures jammed behind a cupboard attached to the wall. As he began to move the wooden structure, items began spilling out of a cavity. 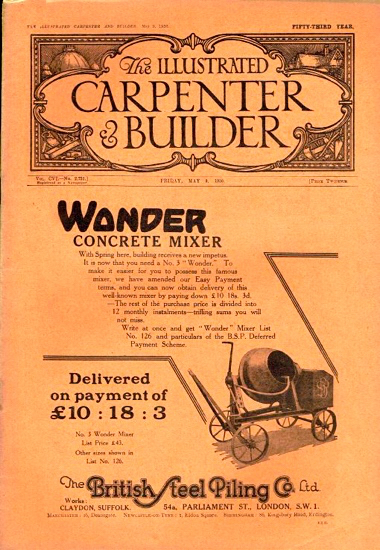 Among the pens and papers that fell to the floor was a dusty and sooty copy of the monthly magazine, ‘The Illustrated Carpenter & Builder’ published in 1930. The magazine, then in its 53rd year displayed a cover price of two pence. Inside, are adverts offering a saw for 10s-6d, a cooking range for £3 (including delivery to any railway station), or a new house, built from scratch, for as little as £500. The magazine also features, an article by the late H.M. Alderman, a local historian. Mr Alderman’s article entitled, ‘Notes and sketches in Hertfordshire’, included information about Shenley, Ridge, Chipping Barnet and North Mymms. However only the information and sketches about North Mymms have been reproduced here. North Mimms, northwest of Barnet and some three miles from Hatfield, is in one of the prettiest parts of the county, undulating and wooded. It is a very large parish, being four and a half miles east to west, and has an area of 4,966 acres. There is no village proper, its population being scattered in several hamlets, as Welham Green, Roestock, Bell Bar, Water End, etc., and at newer parts now developing in and around Brookman’s Park. (note H.M. Alderman used an apostophe in the name Brookmans). The church, dedicated to St. Mary is about half a mile from Welham Green and within the confines of North Mimms Park. (note H.M Alderman used the old spelling of North Mymms). 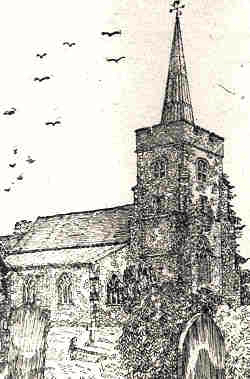 After a careful survey of the whole of the county, I would grant it pride of place as being the most charming village church in Hertfordshire, consisting in plan of a nave, chancel, north and south aisles and north chantry chapel and west tower, it is mostly of the decorated period, unusually pure in style. The oldest part is the north chapel, circa 1328, built by Simon Swanland, for a chantry wherein was said masses for the souls of his parents and dedicated to St. Katherine. The nave and aisles date from 1340, and, as will be seen by examining the chancel arch, a central tower was intended where the chancel now stands, but the idea was never carried out. About this time the plague, known as the ‘Black Death’, raged throughout the land, and may be postulated as a reason for the work being abandoned. The tower is a century later (fifteenth), but the west doorway and the window over are richly decorated, and were undoubtedly originally in the west wall of the nave before the tower was added, but the labels or dry stones over both are fifteenth century work. 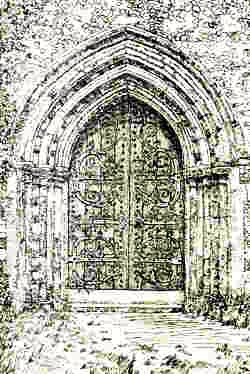 The doorway, is one of the finest of the period in the country, with its triple shafting and foliated caps, and is specially noted in Rickman’s ‘Gothic Architecture’, seventh edition, 1881. The tower is built of stone and flint, with some conglomerate known as Hertfordshire ‘pudding stone’. It is in three stages and embattled, crowned with a graceful copper-covered spire, delightfully panelled and weathered on the south and west sides to a delicate shade of green. It is this which gives the church such a distinctive appearance. There is a ring of eight bells, also a priest’s bell, numbers one to six being cast at Hertford in 1806 by John Briant. On the south east buttress of south aisle is a sundial dating from 1584, and on various other stones in the fabric are ‘scratch’ sundials - without doubt spurious - the work of mischievous hands. In the church are many monuments and brasses, the most important being a brass fixed to north wall of chancel of a mass priest, believed to be William Kesteven, who died in 1361; and a large marble monument to Lord Somers, Baron Evesham, who died at Bookman’s in 1716. This Lord Somers was the famous junior counsel to the Seven Bishops in 1688, Attorney General in 1692, Lord Keeper of the Great Seal from 1692-93, and Lord Chancellor 1697. A notable feature of this monument is the centre panel being hinged to form a door to the vestry. In the churchyard near the south porch is a stone to a Mr. John Cobourne, ‘Sergeant in the North Mimms Company of Volunteers, who died of illness caught in the execution of his duty on January 2, 1802’, a reminder of the days when Napoleon threatened this island. The Rev. F.C. Cass, writing of North Mimms in his history of South Mimms, thinks the priest’s bell (previously mentioned) to be the ‘Saunce Bell’, mentioned in the ‘Byll Indented mayde the ffirst day November in the sidt yeare of the Raigne of our Soveraigne Lorde Edwarde the Sixth’. The church registers “only commence with July 12, 1656, a book having been purchased in 1663 of Richard Williams of St. Albans and the previous entries made up from the former date.” (Rev. F.C. Cass). There exists, however, a curious fragment of an older register containing entries of baptisms between August 15, 1565, and March 27, 1567-8. It may be of interest to note here that an ordinance was made in 1597, afterwards embodied in the 70th Canon of 1603, that every parish was to purchase a parchment volume into which the entries from the old paper books were to be “fairly and legibly copied”. The following interesting reference to North Mimms appears in the “Abstracts of Wills for the Archdeaconry of Huntingdon Hitchin Registry”. “Awdry Ruchlie of North Mymes, beinge sicke on her death bedde 24 December 1583 sent for the miniser there to come to her but her breath drew one so fast that when he saw there was not tyme enough to wright her will he exhorted her first to propare her selfe toward God and next he sayd thus unto her ‘Mother Rushley to whome will yo give yor good’, she mode hym aunswer sayinge to Harrye havinge thus sayd she spake no more and so died with in two howers after.” (Jan 23 1584). In a field to the east of the church are four distinct mounds planted with fir and plane trees. It has been suggested that this is a site of fighting during the Wars of the Roses, and these tumuli are the collective graves of the fallen. One learns to doubt this kind of legend. Possibly they represent nothing more than parkland given over to the plough in the early nineteenth century. The only colourable thing I have been able to discover in support appears in Macfarlane and Thomson’s “History of England”, where they state “The combate (second battle fo st. Albans) was prolonged over the undulating country that lies between St. Albans and Barnet”, which, of course, North Mimms is. An excavation of the mounds would settle the matter, but seeing the churchyard is nearby, it is much more likely the dead would be buried therein, as was done in the Abbey and St. Peter’s churchyard at St Albans, following the two battles there. North Mymms Park is a large red brick manor house built by Sir Richard Coningsby about 1601, the architect is unknown. 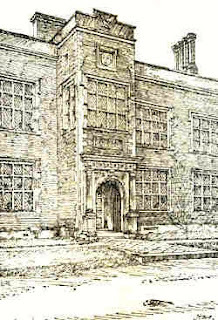 It was considerably restored and additions made toward the end of the last century, but externally the early Jacobean house remains unaltered; and with its stone-mullioned windows, is a finely-proportioned building. The arms over the front entrance - three rabbits or leverets - are those of Sir Ralph Coningsby. 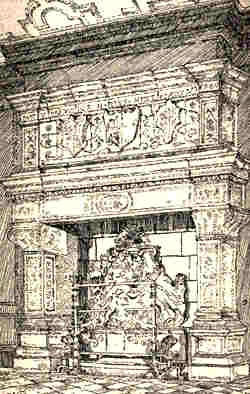 The house contains a fine stone fireplace in the north hall representing Pyramus and Thisbe, and dated 1563, the fireback to which is believed to be coeval. The older manor house, destroyed when the present was built, says the Rev. F.C. Cass, “stood somewhat further towards the north-east end nearer the church, probably filling the space now occupied by a deep ond shaded by trees”. Eastward of Brookman’s is Gobions or Gubbins, where stood a house held in 1500 by Sir John More, father of Sir Thomas More, and occupied by the latter, who is believed to have written his “Utopia” there. “Early in the eighteenth century it came into possession of the Sambrookes of whome Sir Jeremy Sambrooke, interred in the churchyard at North Mimms, erected the commemorative obelisk on the battlefield of Barnet in 1740.” (Rev. F.C. Cass). 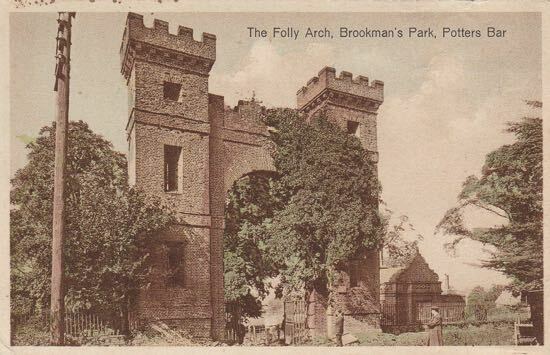 In 1836, the then owner of Brookman’s bought Gobions and razed the house, though I believe traces of the gardens remain at a much later date. 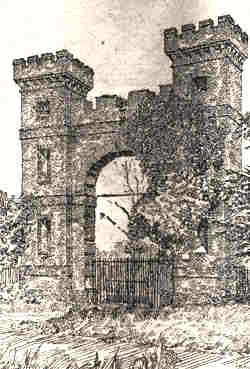 The “Folly Gates” some believe to have been erected during Sir Thomas More’s lifetime to commemorate a visit of Henry VIII. Another story, and the most likely one, is that this huge archway was erected by Sir Jeremy Sambrooke (1740), and there exists a local tradition that a farthing was placed under each brick. It is surprising how this legend in varying forms persists in different parts of the country; there is a bridge in Sussex that I know of, where an identical tale is told. No bricklayer or mason in the course of repairing has ever found one coin embedded, and surely no founder would waste such a large sum of money that a farthing per brick meant a few centuries back. A few moments reflection shows the falseness of the idea. At Water End, in the parish of North Mimms, appears a curious geological phenomenon in the shape of “swallow holes”, in the earth, which in normal weather take the natural drainage of a large districts; for a wide area the ground is riddled with these holes of varying sizes. One, which formed in the space of a single night on December 31, 1928, was 25 foot in diameter and 45 foot to the bottom. They are funnel shaped and of such dimensions as the one stated that they are a source of danger when floodwater is about. It is a remarkable sight to see a fair-sized stream of water disappear with a rush down one of these holes. When the volume of water is greater than the “sponge” will absorb, it floods the surrounding ground and passes along a channel through North Mimms Park, and eventually flows into the River Colne. Geologists account for the holes by water cutting its way through the upper strata till it reached the chalk; this being far from solid, a channel underground is soon found, and chalk being of easy dissolution in water, the channel is gradually enlarged. 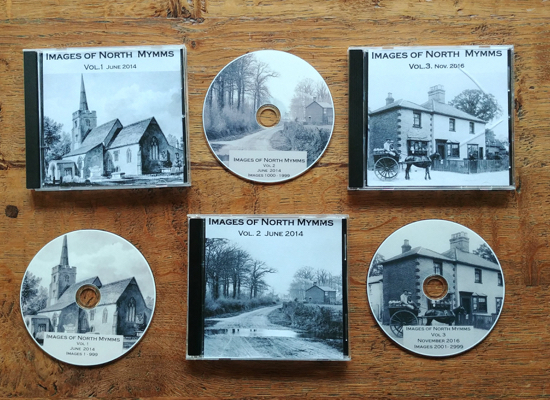 Editor's note: The spelling of North Mymms has changed over the years. The spelling used here is that used by H.M Alderman in the feature and to label his illustrations.